Everlast Services now offers no interest ever! payment plans on products valued up to $15,000. Fees , charges, terms, conditions, lending criteria apply. Modern, affordable, superior quality fencing, concreting and landscaping. Delivered on time, every time. With 20 years experience and a reputation for excellence, we’re 100% committed to delivering the perfect finish every time. We only use quality products and the best tradesmen. We know our finished product will more than satisfy. Whether you have a small courtyard or an expansive block, we’ll deliver your own private garden oasis. At Everlast Services, we pride ourselves on providing the highest quality products and workmanship, at a fair price point. Need a reliable quote for your fencing, concreting and landscaping demands? 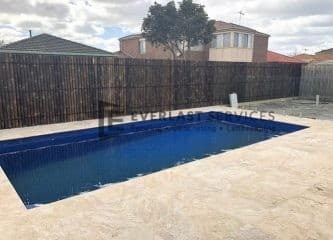 If you need fencing, landscaping or concreting in Melbourne, then look no further than Everlast Services. With over 20 years industry experience, we bring an unparalleled level of expert knowledge and experience to every project. We are a proudly Australian, family owned and run business, located in the western suburbs of Melbourne. With all of our products manufactured directly from our factory in Laverton North we oversee the production of every job that comes through our doors. Because of this, we stand behind the quality, strength and durability of our products 100%, delivering you the highest possible standard of fencing, concreting and landscaping, every time. We pride ourselves on manufacturing quality products, using Australian made and owned materials, and on delivering superior customer service on every job. You can rest assured that from start to finish, your needs will be exceeded by the friendly team at Everlast Services. 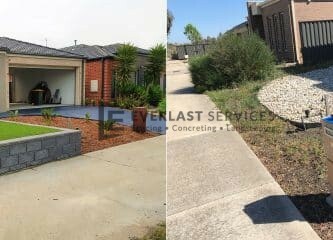 I got many quotations from different landscaping companies to do my front, back yard and concreting work but did not feel comfortable from the dealings until we got engaged with Everlast Services.J and his team were very professional and absolutely awesome to deal with. They are efficient, attentive and provide superb workmanship. Both my wife and I are very happy with the the end result which is amazing.I would definitely recommend Everlast Services and happily use them again in the future!Great work, J and the team! Thank you. I used Everlast to build a steel fence in a period style at the front of my new property. I am very happy with the end result and have had my neighbours comment on how good it looks. The workmanship is of a high standard and I cannot have asked for a better job at a reasonable price. I found the company to be professional and recommend them to anyone considering engaging their services. I got my front yard done, driveway, and concreting done by Everlast services. Jay and the team have done a very good job and my fronyard looks awesome now! They are probably also one of the few that do stencil/stamped concrete. Even my neighbour wants to get stencil concrete too now after looking at mine! I would highly recommend Everlast Services. Jay and all the staff are professional, friendly, and most importantly the double slat gate looks amazing. Thankyou so much. Wow. It is so rare to find a company Director who, not only always answers his phone (even if you call after hours) but is attentive and helpful. Thank you so much to J and the team at Everlast for the fantastic job you did on building and installing our new driveway gate. It exceeded my expectations. This company is one of those rare gems. The entire staff (whether it was J himself, Sophia in the office, Kevin, Bill and the others) were all so pleasant and easy to deal with. Their dedication to the task at hand and quality of workmanship is truly reflective of how brilliant this team is and how much pride they take in their work. I cannot speak more highly of this company. I have no hesitation in recommending them. We will definitely be repeat customers. 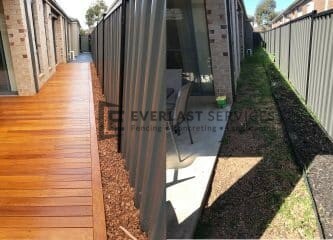 Have just finished our backyard landscaping with Everlast - from the very start, J has been amazing to work with - responsive, attentive and a genuinely decent person. He and his team pulled out all the stops to get the job done, working with our plans and carrying out the work with such precision (you just have to look at the alignment of screws on the deck to see the level of detail). Being an architect, we can be pretty tricky clients, but J and the guys gave us no cause for concern. We couldn't be happier with the end result - what was once an empty eyesore is now a stunning decked and artificial grassed area that is an absolute pleasure to spend time in - have a look at the small sample photo below, the whole picture is amazing! Would 100% recommend to others - a rare gem of a company for quality of customer service and delivery. Absolutely best experience with J and the whole team. 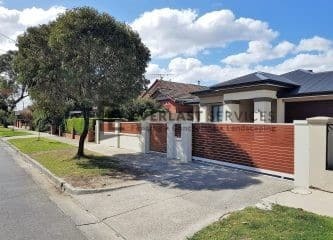 They did all fencing and landscaping work for my new house in West Melbourne, the job quality is second to none. Everyone is so friendly and helpful, love the “can do” attitude. Also, such thorough and detailed explanation on every single step, plus useful and professional advice. You just cannot go wrong with these guys. They don’t need a long review, do yourself a favour, just give J a call and you will see. Let's start with the people. All the guys at Everlast Services are great to deal with, all the way from quotation (J) process right up to delivery (Max, Yama & team). I always believe that the quality of the people reflects in the quality of the work they do - and in the case of Everlast Services, a job well done! Thank you J & team for being extremely professional in all dealings throughout the process. "You can count on J, to make your day"
The initial discussion with Everlast was all that made the difference. They knew what they were doing and were ready to accommodate my plans as well as advice on what will work and what will not. 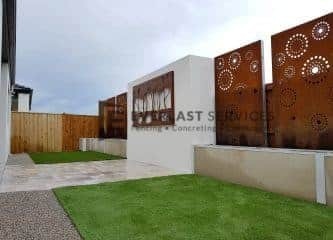 During the whole process of concreting, landscaping and fencing, they were very professional and I was always made aware of any challenges and how things were progressing. Everyone who passed by the house was equally impressed and were happy to engage them as well. 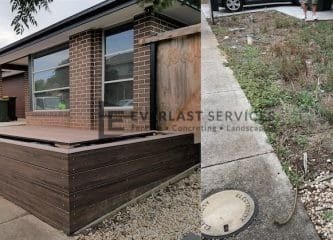 I will recommend Everlast Services for any concreting, landscaping and fencing works.